Height Range: 36.9 to 66.8"
Get a tripod system that stands up to the demands of ENG and EFP production with the 100CF1HD 100mm Carbon Fiber Tripod & Agile 18 Fluid Head System with E-Z-Load camera interface from OZEN. 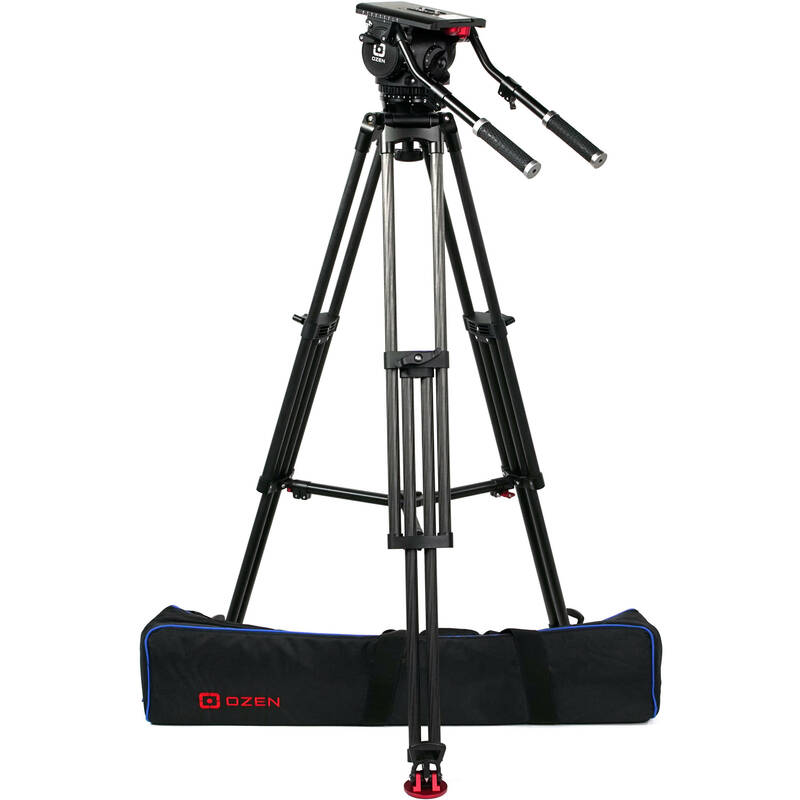 Comprising a 100CF1HD 100mm single-stage, heavy-duty carbon fiber tripod and an Agile 18 fluid head, this system works with 4.4 to 48.4 lb payloads. It offers 16-step counterbalance, 7/7 + 0 pan/tilt fluid drag, and working heights ranging from 36.9 to 66.8". The 100CF1HD comes equipped with a Contender heavy-duty mid-level spreader, as well as with deep-tread rubber feet for better traction on smooth surfaces. Included with the system is a SoftCase 100HD1, which has a carry strap and an internal pouch for storing the included telescopic pan bars. Give your camera solid feet to stand on with the 100CF1HD 100mm Single-Stage, Heavy-Duty Carbon Fiber Tripod from OZEN. Designed for heavy-payload and high-fluid-drag applications, this single-stage tripod supports up to 99 pounds and offers working heights ranging from 28.7 to 58.6". For greater rigidity, the 22mm diameter carbon fiber tripod leg tubes are pin-secured to their anchors—no glued joints. Twist brake levers with positive stops are used to lock the legs into place. Moreover, the 100CF1HD comes equipped with a Contender heavy-duty mid-level spreader, as well as with deep-tread rubber feet for better traction on smooth surfaces. Smooth your pans and tilts with the Agile 18 Fluid Head from OZEN. Designed for fast setup in ENG- and EFP-style shooting scenarios, the Agile 18 is equipped with a CNC-machined dial mechanism for crisp, repeatable counterbalance adjustment in 16 steps. The Agile 18's versatile design enables you to quickly change camcorder configurations within a payload range of 4.4 to 48.4 pounds. The Agile 18 is equipped with a 7/7 + 0 fluid drag mechanism and offers a tilt range of 90 to -80°. The considerable amount of fluid drag available at higher increments enables experienced operators to acquire full-zoom, pan/tilt-intensive images that are indistinguishable from those acquired in close. This fluid head uses the full-sized E-Z Load camera mounting interface, which is compatible with the industry-standard spring-loaded, capture-type interface and fits the pace of shoot & scoot workflows. The OZEN Soft Case for Single-Stage Heavy-Duty 100mm Systems for 100HD1 Tripod is a spare/replacement part. Users will appreciate the internal pouch for storing a pan bar and carry strap.